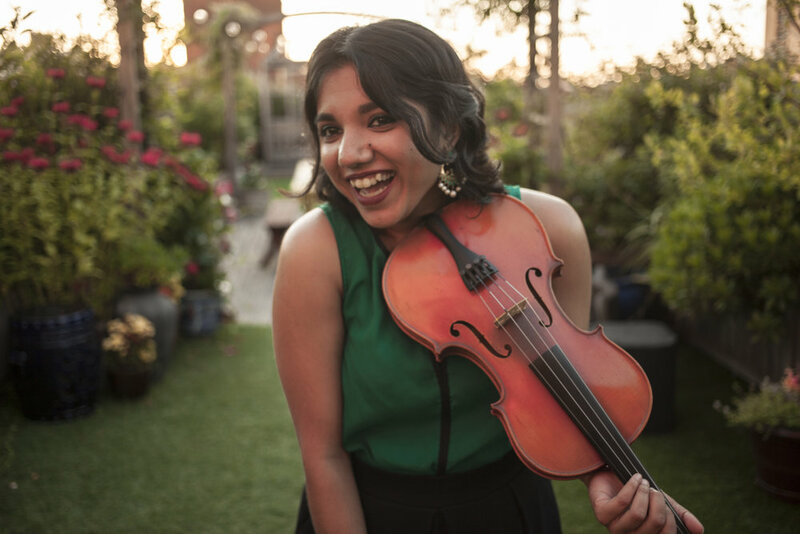 “Studying Carnatic music, one of the art music traditions of South India feels more profound than ever, but my study is enriched and amplified by my growing curiosity about other musical genres like Hindustani music, jazz, creative music, and maqam. In keeping with this, my recent forays into composing hybrid music have involved a purposeful and personalized dismantling of conventional structures. I consider the lineage of Carnatic compositions, which rely not on written scores preserved for years and years, but on centuries of listening, adjusting, and finding home in a piece of music that is constantly shifting to the person, the place, and the time in which it is being sung." Anjna Swaminathan is a versatile composer and artist in the field of South Indian Carnatic Violin. A disciple of the late violin maestro Parur Sri M.S. Gopalakrishnan and Mysore Sri H.K. Narasimhamurthy, she performs regularly in Carnatic, Hindustani and creative music settings. In the summer of 2014, Anjna was a participant at the celebrated Banff International Workshop in Jazz and Creative Music in Alberta, Canada, where she worked closely with eminent jazz and creative musicians, and led workshops on the fundamentals of Carnatic improvisation and listening. She has since performed with and been encouraged by established musicians in New York's thriving creative music scene including Jen Shyu, Vijay Iyer, Tyshawn Sorey, Amir ElSaffar, Imani Uzuri, Stephan Crump, Mat Maneri, Miles Okazaki and others. Anjna is a member of the ensemble RAJAS, led by her sister, percussionist-composer Rajna Swaminathan, which features a rotating collective of Indian classical musicians and jazz/creative musicians, and seeks to explore new improvisational and compositional possibilities stemming from the Indian classical idiom. In 2015, Anjna came under the tutelage of renowned vocalist and scholar, T.M. Krishna for her training in Carnatic music, and vocalist Samarth Nagarkar for her training in Hindustani music and accompaniment. She frequently engages with the burgeoning community of Indian classical musicians in New York and New Jersey, and is an active member of the Brooklyn Raga Massive, a growing artist-managed collective of musicians, performers and educators with a firm grounding in raga-based music and a mission to create a diverse, community-oriented artistic practice. As a theatre artist, writer and dramaturg with interests in the intersection of race, class/caste, gender and sexuality, Hindu vedantic philosophy, and the boundaries of postcolonial Indian nationhood, Anjna often engages in artistic work that ties together multiple aesthetic forms towards a critical consciousness. She frequently takes part in interdisciplinary collaborations, often developing scores and providing musical accompaniment for Bharatanatyam (South Indian classical) dancers and dance companies, most notably, Rama Vaidyanathan, Mythily Prakash, Malini Srinivasan and Ragamala Dance. More recently, Anjna has delved into the realm of composition, and was commissioned (with co-composers Rajna Swaminathan and Sam McCormally) to create an original score for playwright/performer Anu Yadav's one-woman-play Meena's Dream. In her dramaturgical and theatrical work, she has a keen interest in developing new projects that seek to problematize the hierarchies of caste and gender that are inherent in her musical idiom, something that deeply informs her musical practice.